It’s no secret that despite recent victories, a glass ceiling still persists in the insurance industry. There are simply not enough women at the leadership level, even though countless inspiring, talented and capable female insur­ance professionals stand ready. Mentorship is the key to raising these future female leaders, removing bias from the workplace and finally shattering that divide forever. It is our moment for pioneering women and enlightened men to use mentorship as a prac­tical action to create workplace equality and reimagine the C-suite. As a grassroots movement, mentoring has actionable purpose. Mentors and mentees form a bond – sometimes it’s short and laser-focused; other times it is a lasting rela­tionship. I have experienced both, and both serve a crucial purpose. If there is a catalyst to fuel shifting bias, to build leaders and to instill confidence, I believe mentorship is it. Mentors and mentees stand together to learn from one another, identify opportunities and ignite positive change. Meaningful dialogues among professionals of all levels are the foundation of an inclusive workforce. As we reimagine mentoring, envision a set of shoeboxes stacked one atop the other. In the boxes, choose the shoes you need to find your match. The match you seek at this point in your career likely won’t be the same match you will need five years, one year or even 60 days from now. What do you need today? Maybe it’s an opposite-gender mentor, a peer mentor, a reverse mentor, a family mentor or a tough-love mentor. Cultivating and nurturing your mentor relationship so the match is easy and impactful is an art that takes intentionality and must be perfected. The most powerful collaborations are based on pure trust and unwavering honesty. They also require the courage to have difficult but necessary conver­sations. Honest, sincere connections allow us to develop ourselves and inspire change. - Be open to a mentor or mentee who does not look, act or feel like you. This is often the best kind! - Show up with transparency. Honesty is the backbone of this relationship. - Share the wisdom and lessons. Be brave and tell your personal stories. It’s in this vulnerability that lessons are learned and victories are celebrated. - Set expectations, guardrails, boundaries and goals. - Follow up, care, nurture and push. - Deliver on your promises. - Be gentle with each other. There is no ‘perfect’; there is only a journey. - Lead with curiosity. Be a lifelong student. - Cultivate relationships, as they are the lasting treasures. A male CEO mentor had the courage to teach me a valuable and lasting lesson that I call ‘the power of we and I.’ He shared that the all-male board I presented to perceived my use of ‘we’ in my examples and statements as a lack of personal accountability; I often ‘we, we, we’d’ myself out of consideration. Lesson learned: I gave myself permission to say ‘I’ and blend it with the collaborative, collegial ‘we’ that’s part of my personal DNA. Sometimes mentorship happens when you least expect it and you aren’t looking. Seize those moments! I am proud to say I have a new mentor: the energetic and iconic Edie Fraser. As a pioneer in diversity and inclu­sion, she founded Million Women Mentors [MWM] and STEMconnector and was the founder of Diversity Best Practices before that. I encourage the broader industry to join her global MWM movement, which already has more than 2.3 million commitments to mentor, sponsor, provide interns and build women into and up the system for great careers. 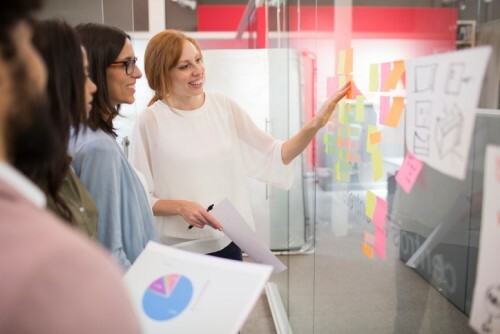 High on my personal wish list for the insur­ance industry is data to support our story and to frame our go-forward agenda as we strive for gender parity in the C-suite and other leadership roles. We have a moment to come together to gather, share and publicize the success stories that will amplify our efforts. This is a vocal and vibrant movement where women and men are joining forces to make a difference with each and every relationship and where each opportunity builds awareness and results. Margaret Resce Milkint is a talent strategist and diversity and inclusion catalyst. She is a managing partner at The Jacobson Group, the leading provider of insurance executive search and staffing services.